It’s finally warm enough to cook an outdoor meal in Denmark. Heat up your grill and give these a try. It’s a true California recipe and one you will want to keep or tweek! Note: Prepare a day in advance. Slice the flank steak and flatten the slices with a meat hammer (or wooden spoon). Prepare the marinade by mixing all ingredients. Marinate the meat over night or at least 6 hours. Cook 2-4 min per side depending on the heat and thickness of the meat. Update: Instead of spending time pounding on the meat to flatten it, I have found a much better way to get it thin. Simply freeze the meat for about 30-45 minutes, then slice it at a 45 degree angle, you can get the slices really thin this way. So much easier and the meat turns out so tender. 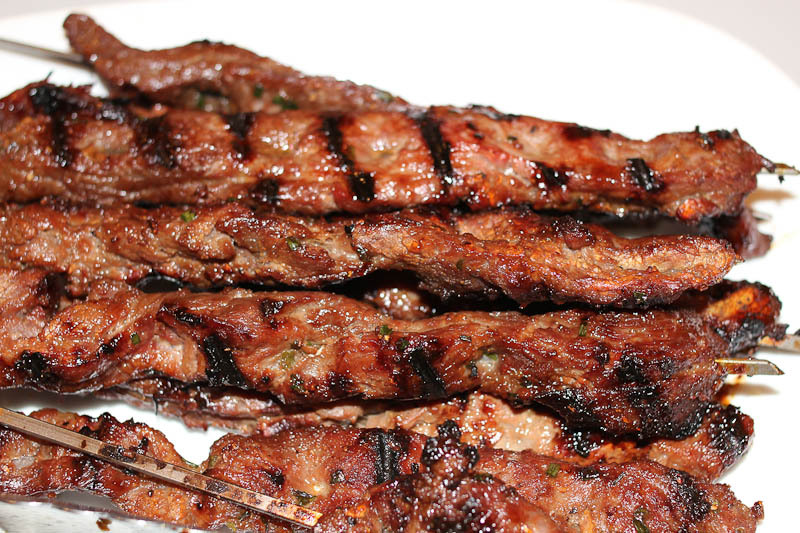 I don’t even bother with the skewers, I put the flank strips right on the grill. Yum. This entry was posted in Meat eats and tagged barbeque, cooking, dinner, flank steak, food, healthy food blog, marinate, recipes. Bookmark the permalink.